Water issues in the eastern parts of the HKH can be summed up in a paradox, ‘scarcity amidst plenty’. This region, comprising of eastern Nepal and eastern parts of the Indo-Gangetic plains in India and Bangladesh, receives plenty of rainfall and has good groundwater potential. However, only a small proportion of this potential has been exploited and agricultural communities face severe agricultural water scarcity due to the lack of affordable energy for pumping groundwater. Most of these areas grow a single crop in a year and farmers leave land fallow in the winter and summer. This phenomenon of water scarcity amidst physical plenty is called ‘economic and institutional water scarcity’ (Molden, ed 2007) and is caused, as the name suggests, by economic and institutional factors. Are there any technological alternatives that will enable small holder farmers to grow more crops in a year by utilizing abundant groundwater and without polluting the environment? 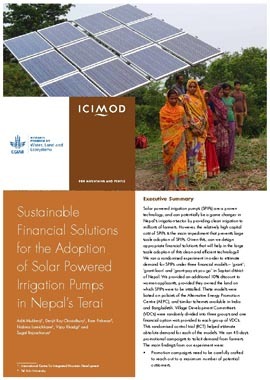 Solar powered irrigation pumps (SPIPs) provides one such alternative. SPIPs have been tested widely in the region and have been found to be a technically proven and workable solution. They are suitable for all categories of farms—large holder, small holder, and farms owned by women and men. ICIMOD piloted three one horsepower (hp) SPIPs in Saptari district of the Terai region in Nepal and found that they can operate for up to 1,150–1,250 hours a year, give a daily discharge of 60,000–70,000 litres, and can provide enough water to irrigate up to 7.5 hectares of land in a year to grow profitable crops like vegetables in the winter and summer, thereby increasing income and nutritional outcomes for women, children, and men. However, the relatively high costs of these pumps—the cheapest 1 hp (1200 kilowatt peak) costs around USD 3,800 per piece—means that it is not easily affordable to small holder farmers. All countries in South Asia provide different financial incentives, like subsidies and loans for the uptake of SPIPs. However, existing literature shows that uptake of SPIPs is limited to richer farmers due to the way subsidies are administered leaving small holder farmers, women and men, outside the ambit of the benefits of subsidies given by governments. Is there any way of providing financially sustainable options for the adoption of SPIPs for small holder farmers (both women and men) in ways that are robust and can be replicated elsewhere? An ICIMOD led and WLE funded project looked at ways of providing sustainable financial solutions for women and men farmers to own (or rent) and operate SPIPs. With the support from the Consultative Group for International Agricultural Research (CGIAR) on Water Land and Ecosystems (WLE), the International Centre for Integrated Mountain Development (ICIMOD) is leading the initiative ‘Reviving springs and providing access to solar powered irrigation pumps through community based water use planning with multiple approaches to solving agricultural water problems in the mid-hills and Terai in India and Nepal’.